In April 2014 Sentinel-1 was launched, as the first of a fleet of European satellites developed to deliver Earth observation data for the Copernicus programme. The Copernicus Services offer full, free and open access to data, models and forecasts related to the monitoring of our environment. But then what? With Terrascope we want to provide EO data, consumable information products as well as end-to-end operational services, to give you the insights you need! The Sentinel satellites observe the Earth in detail with an impressive repeat rate. With the setup of Terrascope, ESA’s Collaborative Ground Segment in Belgium, we want to bring all this EO data to Belgian authorities, researchers, industry and even our citizens in an easy way. Because Earth observation data can be used in more ways than you would imagine. Today, 19 April 2018, we are excited to launch Terraviewer, a first step in offering access and use for Sentinel, PROBA-V and SPOT-VEGETATION data. 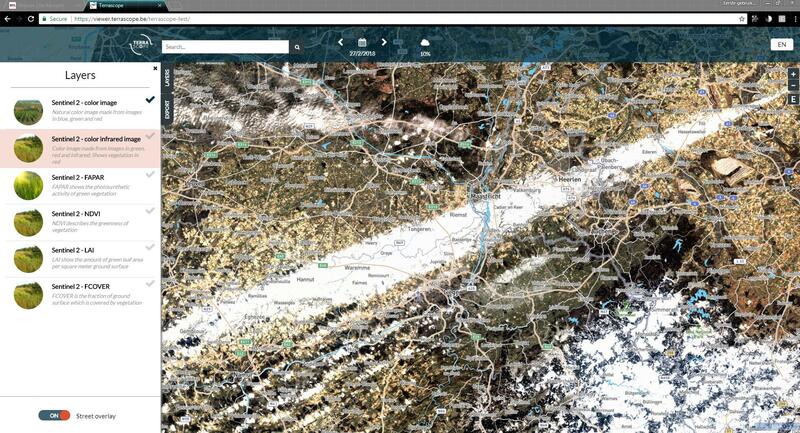 Have a look at the image of 27 February 2018, where a white band is visible to the north of Liège. You might think it is a cloud, but in fact it is snow on the ground, which originated from the industry in the Ruhr area in Germany and was blown to Belgium by a cold North-Easterly wind. 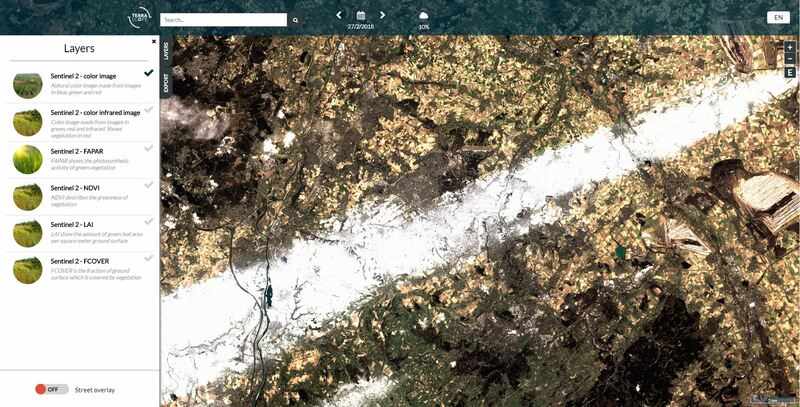 Terraviewer is just the tip of the ice berg. Sentinel satellites produce so much more data. In fact, Sentinel-2 makes images in 13 different colors, in the visual and infrared spectrum. Some of these are used to calculate the FAPAR and other indices, but so much more is possible. Environmental monitoring, agricultural management or urban development are just a couple of the applications that can benefit by using Earth observation data. For now, all that data is available for you to download. Terabytes of it, and growing by many Gigabytes every day. So, download is not a serious option for most of us. Terrascope will extract the relevant information from the data, and offer experts a way to upload their algorithms and process the data on the Terrascope platform, and then download just the results. By taking it one step further, we can fully use the information that can be retrieved from Earth-observation data combined. So there’s more to come in the next release. To serve you, you and you! Next to Sentinel-2, you can also download Sentinel-1 data. This satellite uses RADAR technology to observe the Earth. One of the beautiful aspects of working with RADAR data is you can look straight through clouds and work day and night. This is extremely interesting for risk analysis, crisis monitoring, etc.